Some may wonder, Why must the age be ushered in by God Himself? Cannot a created being stand in His stead? You are all aware that God becomes flesh for the express purpose of ushering in a new age, and, of course, when He ushers in a new age, He will have concluded the former age at the same time. God is the Beginning and the End; it is He Himself who sets His work in motion and so it must be He Himself who concludes the former age. That is the proof that He defeats Satan and conquers the world. Each time He Himself works among man, it is the beginning of a new battle. Without the beginning of new work, there would naturally be no conclusion of the old. And when there is no conclusion of the old, this is proof that the battle with Satan has yet to come to a close. Only if God Himself comes, and carries out new work among man, can man break completely free of the domain of Satan and gain a new life and a new beginning. Otherwise, man shall forever live in the old age and forever live under the old influence of Satan. With every age led by God, a part of man is set free, and thus man advances along with the work of God toward the new age. The victory of God means a victory for all those who follow Him. If the race of created human beings were charged with concluding the age, then be it from the viewpoint of man or of Satan, this would be no more than an act of opposing or betraying God, not one of obedience to God, and the work of man would become a tool for Satan. Only if man obeys and follows God in an age ushered in by God Himself can Satan be fully convinced, for that is the duty of a created being. And so I say that you need only follow and obey, and no more is required of you. This is what is meant by each keeping to his duty and each performing his respective function. God does His own work and has no need for man to do it in His stead, nor does He participate in the work of created beings. Man performs his own duty and does not participate in the work of God. Only this is obedience, and proof of Satan’s defeat. After God Himself has finished ushering in the new age, He no longer comes down to work in the midst of mankind Himself. It is only then that man officially steps into the new age to perform his duty and carry out his mission as a created being. These are the principles governing work, which no one may transgress. Only working in this way is sensible and reasonable. The work of God is to be done by God Himself. It is He who sets His work in motion, and it is He who concludes His work. It is He who plans the work, and it is He who manages it, and even more, it is He who brings the work to fruition. As stated in the Bible, “I am the Beginning and the End; I am the Sower and the Reaper.” All that pertains to the work of His management is done by God Himself. He is the Ruler of the six-thousand-year management plan; no one can do His work in His stead and no one can bring His work to a close, for it is He who holds everything in His hand. Having created the world, He will lead the entire world to live in His light, and He will also conclude the entire age, thereby bringing His entire plan to fruition! In the Age of Grace, the Lord Jesus promised to His followers, “And if I go and prepare a place for you, I will come again, and receive you to Myself; that where I am, there you may be also” (Jhn 14:3). He also prophesied, “For as the lightning comes out of the east, and shines even to the west; so shall also the coming of the Son of man be” (Mat 24:27). In the last days, as promised and foretold by Himself, God has again become flesh and descended to the East of the world—China—to do the work of judgment, chastisement, conquest, and salvation using the word, on the foundation of the redemption work of the Lord Jesus. In this, the prophecies of the Bible that “Judgment begins with the house of God” (1Pe 4:17) and “He that has an ear, let him hear what the Spirit says to the churches” (Rev 2:7) have also been fulfilled. God’s work of the last days has ended the Age of Grace and ushered in the Age of Kingdom. As the gospel of the kingdom of Almighty God spread rapidly in Mainland China, The Church of Almighty God came into being. As proven by facts, The Church of Almighty God came into being entirely as a result of God’s work of the last days, and was not established by any man. This is because the chosen people in The Church of Almighty God pray in the name of Almighty God, obey His work, and accept all the truths expressed by Him. Thus it is evident that these chosen people believe in Christ who is incarnated in the last days, the practical God who is the Spirit realized in the flesh, instead of believing in a man. Outwardly, Almighty God is nothing more than an ordinary Son of man, but in substance He is the embodiment of God’s Spirit and is the truth, the way, and the life. His work and word are the direct expression of the Spirit of God and are the appearance of God in person. Therefore, He is the practical God who is incarnated. The Christians of The Church of Almighty God accept and follow Almighty God as they see the expression of Almighty God is all the truth. They recognize that Almighty God is the second coming of the Lord Jesus. Yet the CCP government does not recognize the existence of God. It refers to religious organizations and churches as human organizations. Religious groups are designated as human organizations by unbelievers and the atheist government. This is unsubstantiated internationally. As we all know, religious beliefs are commonly recognized by the international community. All democratic countries recognize religious beliefs, recognize freedom of belief and respect religious groups. International conventions also recognize the freedom of religious belief. Why doesn’t the CCP? Because the CCP is an atheist political party that does not recognize the existence and incarnation of God, let alone respect freedom of belief. Since the CCP took power, it has steadfastly persecuted freedom of belief, designating religious groups as human organizations for restriction, persecution and suppression. But The Church of Almighty God’s millions or even tens of millions of Christians all recognizes that the word expressed by Almighty God is the truth and the voice of God. No one can deny that Almighty God is the returned Lord Jesus, the appearance of God in the last days. Just as when the Lord Jesus was doing His work, the Roman government and Judaism did not recognize it. But two thousand years later, the gospel of the Lord Jesus has spread throughout the world all the same. All countries in the world have recognized that Christianity is a pure faith. What is reason for this? It is because the truth is the truth, and God’s word is the truth. How can man’s persistent notions about God be resolved? This requires pursuit of the truth. For example, some people claim I [the man used by the Holy Spirit] have embezzled the church’s funds, that I stole them and ran away. Is this correct? I would not steal the church’s money and run off. I’m responsible for managing and allocating offerings to God. How could that be called taking them and running away? That’s not called running off with them, it’s called taking responsibility for allocating this money, and I have the authority to do so. So, that is an erroneous claim. Some say I fled China to go overseas. Is this correct? I did not flee the country. I carried out my work in mainland China for over ten years. In my wildest dreams, I never imagined that God would send me abroad. I thought that as long as God was doing His work in China, I would carry out my duty in China. I never thought of leaving, but this is where God led me; it was His instruction. At the time I had reservations, “I am on a CCP wanted list. If God has me leave the country, won’t I be caught at customs? Isn’t this asking for trouble? If anything goes wrong, I’ll surely be caught!” But I didn’t say these things; I just said to myself, “Obey. Leave!” As a result, at customs, I narrowly escaped being caught, and it was God’s guidance and protection that got me through. Would you call this running away? This was the Holy Spirit’s guidance; it was God’s instruction. So, once again the rumor spread by the Chinese Communist Party is wrong. They say I fled the country because I was being hunted down, but that doesn’t adhere to the truth. I had never considered going abroad. It was God’s instruction to do so—He sent me. I took the risk and obeyed, albeit reluctantly, and so He led me through customs safely. What was I thinking at the time? “If I make it through customs, it will be because God has led me through. If I do not make it through, then it will be because God has handed me over to Satan.” I accepted this, and I obeyed. For instance, the Chinese Communist Party said I [the man used by the Holy Spirit] embezzled money and fled to the United States. How can you explain that? Some say, “That’s right. He is in the US indeed.” Was that fleeing to the US? It was being led here by God. It was God who dispatched me from China to the US to do work under His command. If it weren’t for God’s guidance, could a person escape? I am one of the most wanted national fugitives by the Communist Party in the mainland China. How would I dare leave? At that time, I thought, “If I leave, won’t I be captured?” So, this was not my own impetus—I was dispatched by God. It was God who told me that I had to leave. When I heard it, I thought, “Oh, this is God’s word. Every time God’s work approaches a turning point, God always says something in advance that comes true later. God has spoken of going abroad and it was not a joke. It is His arrangement!” Thus, I began preparations and I was able to leave as soon as everything had been handled. It was all led by God. It was hopeless in people’s eyes. Now you say—was it that I fled to the US, or was it that God led me and arranged for me to come? (God led you.) The Chinese Communist Party said that I embezzled money and fled, but that was not embezzled money. Those were offerings God’s chosen people offered to God, which I am in charge of and empowered to maneuver and control. Is that embezzlement? Do you think it was like a corrupt official just wantonly fleeing with embezzled money? What do embezzlement and flight refer to? It’s fleeing with money taken from the country and the common people. That is called fleeing with embezzled money. Was that what I did? On the surface, it looks true. First, I came to the US. Second, I am in charge of a portion of the money. But when it comes out of the CCP’s mouth, it turns into something negative. Now that I’ve told you the real story, you know that all of this is positive. On the surface there appears to be a lot of things that coincide with the facts, but the CCP’s presentation of it distorts the truth; they turn right into wrong. Do you get it now? “If any man come to Me, and hate not his father, and mother, and wife, and children, and brothers, and sisters, yes, and his own life also, he cannot be My disciple” (Luke 14:26). “Truly I say to you, There is no man that has left house, or parents, or brothers, or wife, or children, for the kingdom of God’s sake, Who shall not receive manifold more in this present time, and in the world to come life everlasting” (Luke 18:29-30). The Chinese Communist Party says: “The Church of Almighty God asks people to leave behind everything in order to follow God. This is breaking up families.” In Christianity, didn’t the Lord Jesus demand such things from man? Have not the saints through the ages been doing so? These kinds of testimonies have all been performed starting long ago, so why does the CCP condemn The Church of Almighty God? Didn’t the Lord Jesus say such words? Have not the saints through the ages left their marriages, their families, and the world in the name of God, to follow God, to preach and bear witness for the Lord Jesus? There have been so many. Which law from which country condemns this as a crime? Is it fair for the CCP to say this? Is this the reality? To follow God, to pursue the truth, to devote themselves for the sake of righteousness—these are things people happily choose to do. Has the house of God ever forced anyone? Wasn’t this also a requirement of the Lord Jesus’ work during the Age of Grace? What did the Lord Jesus say? “Whoever he be of you that forsakes not all that he has, he cannot be My disciple” (Luk 14:33). The Lord Jesus called on the twelve disciples Himself, and said, “Come you after Me” (Mak 1:17). He also said, “Go you into all the world, and preach the gospel to every creature” (Mak 16:15). Could the Lord Jesus really have been wrong in saying so? This is recorded in the Bible. This has been the practice of all of the religious communities, those who serve the Lord and all the saints through the ages. Why does the CCP come here and vilify The Church of Almighty God by saying that it breaks up families? Is this not a pack of lies told by Satan? You are following God, yet you are unable to see through this. You can’t differentiate between true and false, or tell black from white. 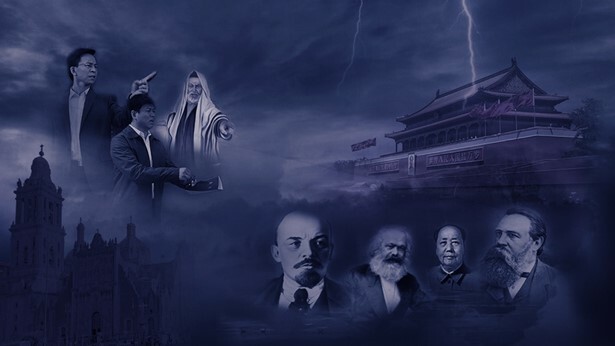 The Chinese Communist Party is now spreading rumors all over the place against God’s chosen people, particularly those who have given up their families to perform their duties; they are attacking, judging, and defaming The Church of Almighty God. They say: “It is The Church of Almighty God that destroys people’s families, separating families and not allowing people to stay with their families.” Isn’t that fabricating rumors and making attacks? What kind of a family would you say that dark and evil mankind belongs to? Is that a positive thing? That kind of family is not a positive thing. What is wrong with someone leaving behind a family of Satan when he really believes in God? This is perfectly justified! “I cast aside everything to expend myself for God and do God’s will. Why shouldn’t I do that? I abandoned the family that kept me from practicing my faith and pursuing the truth. What was wrong with that? The path that a believer follows is distinctly different from that of a non-believer. I want to pursue the truth and follow God. If you disagree, I will divorce you. What could be wrong with that?” Such a divorce is more meaningful than those who divorce because of adultery and a desire for novelty! That kind of divorce is called destroying a family! We abandon everything and leave our families behind that are subject to Satan’s influence so that we may follow God and pursue the truth. This is called renouncing darkness to seek the light. This is a just act that is consistent with God’s will. It is a positive thing. Isn’t it better than following Satan into destruction? Next：What really is the evil essence of the CCP government and the religious world?